Las Vegas, the primary engine of tourism growth in Nevada, continues to rebound from the recessionary doldrums of past years, said speakers at a recent tourism summit. Ralenkotter was a keynote speaker at the recent Governor’s Global Tourism Summit at the Flamingo Hotel on the Las Vegas Strip. 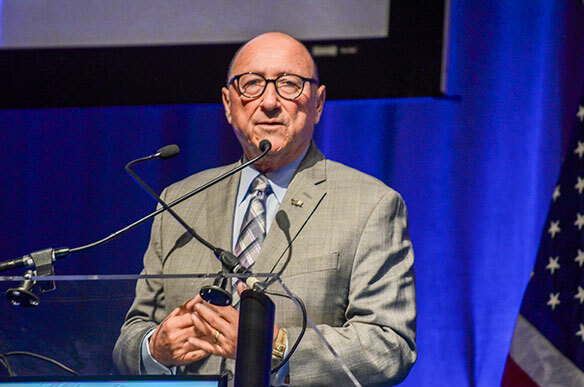 During his address, he listed the primary signposts of current and future growth for the city’s tourism industry, which must fill about 150,000 hotel rooms per night. Top amongst those is a steady increase in the number of international visitors. These grew by 19% in the past year, and are essential to the Las Vegas success story, said Ralenkotter. Another key element is the wave of professional sports teams that are being launched in Vegas. This includes the successful introduction of the Vegas Golden Knights NHL hockey team, which has posted a winning record to date, and is playing to full houses at the new T-Mobile Arena. Next up will be the move of the Oakland Raiders NFL franchise to the Nevada desert. It will kick off its first season as the Las Vegas Raiders at a new 65,000-seat stadium in 2020. The stadium is yet to be built, but the site is being prepared now. Las Vegas meetings and convention business is another pillar of commerce, which also continues to grow. For instance, an expansion of the Las Vegas Convention Center, from 1.9 million sq. ft. to 3.5 million sq. ft., will start in the spring of 2018, with an investment of US$1.4 billion. Las Vegas continues to be the primary generator of tourism dollars in the state of Nevada, but a hotel tax fund is ensuring that some of the wealth is distributed to tourism ventures in other parts of the state. That’s a good thing for visitors, who continue to find many attractions in Nevada outside of the glitz and glamour of Vegas. The Nevada Commission on Tourism (NCOT) has approved US$660,600 in grants for rural tourism organizations to promote their destinations, and these will be distributed by the Nevada Division of Tourism. The division receives three-eighths of one per cent of room tax revenues as its operations budget, and a portion of this is used for the rural grants program.